Image: Malandrino/Getty Images. Design: Ashley Britton/SheKnows. At some point, plenty of strained parents wonder, "Is my kid crazy?" In fact, typical toddler behavior — tantrums, defiance, mercurial mood swings — can lend itself to such questions on a fairly frequent basis. In most instances, you can rest assured that your child is not a sociopath intent on becoming a real-life Dexter (if you want to get into the weeds about it, Dr. Robert D. Hare's long-standing study published in Psychological Assessment in 1989 on the two-factor concept of psychopathy offers the foremost criteria for the disorder). But even if that concern has never crossed your mind, you should still be thinking about how to actively teach your child to have empathy and compassion for others. Because you don't just want a kid who’s not a sociopath (that's a pretty low bar, eh?). You want to raise a child who is kind and considerate, who grows up to be an upstanding citizen, even an activist. You want your kid to have the emotional intelligence that lets them make the world a better place. Right? But how do you teach a kid something as simple yet complicated as empathy? We tapped behavioral specialist and anthropologist Dr. Gwen Dewar — as well as evidence from related studies — for the tips below. Per a 2014 study by Decety and Cowell out of the psychology department at the University of Chicago, empathy isn't a fixed trait or what Dewar calls "an all-or-nothing proposition." Instead, she explains, "there are different facets and degrees of empathy, and the way we socialize children matters." Empathy is the ability to understand and share the feelings of others. It’s essentially being able to put yourself in someone else’s shoes — one step up from plain-old sympathy. 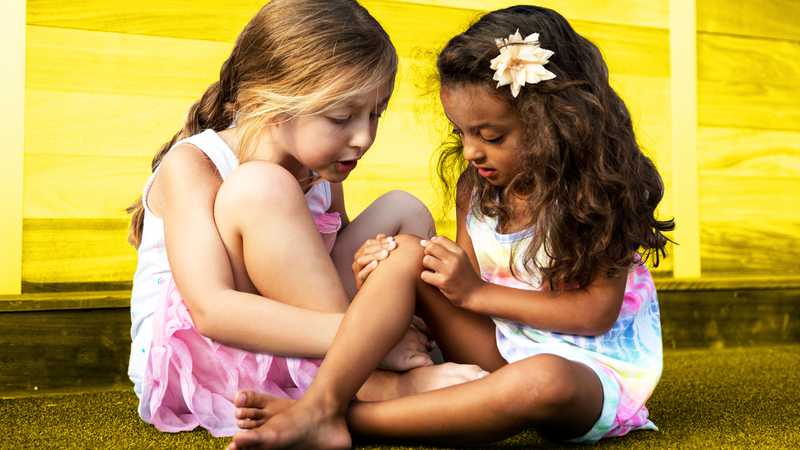 And while it may seem silly to think you can teach a baby or toddler the art of empathy, there are actually some really important and easy things you can do to lay the groundwork for a lasting process of growth and compassion. Your child can learn empathy before they even learn language; Dewar suggests using hand gestures, facial expressions and other body language to communicate with your baby. This will help them understand that they can do the same to express themselves — and it will help develop their emotional intelligence and aid them in beginning to read others based on their visual cues. Have you heard the joke about the serial killer who was never hugged as a child? There may be some truth to that, Dewar posits. Your kids need affection — so hug them, OK? Read: 7 Tips to Help Working Moms Maximize Their "Kid Time"
Ask your kids how they’re feeling, Dewar urges. Acknowledge their moods and help them think through why they feel a certain way rather than simply discouraging strong emotions or shutting them down. A 2014 study by Laranjo in the Journal of Experimental Child Psychology from the department of psychology at the University of Montreal showed that toddlers as young as 12 months can be taught "mind skills" that help them develop healthy ways to acknowledge emotions. Point things out wherever you go — people walking down the street, the dogs in the park, the old man at the grocery store. Don’t just dive into screen time or think your child will simply observe on their own and pick up on things. Help them see how fascinating the world around them is and how much they can learn from it, including how they can relate to other people. Be hyper-aware of your own emotions and how you display them. Explain to your child why you feel a certain way or are reacting to something in particular. Allow yourself to feel things in the moment and exhibit healthy responses (which include letting yourself be angry or frustrated or sad — and then moving through it and back to your place of homeostasis and calm). Repressing emotions and showing your kid that you’re always “fine” can actually be more harmful than helpful (studies such as Srivastava's 2009 findings out of the University of Oregon published in the Journal of personality and social psychology have proven this). Allow your child to see the full range of human emotions so they can validate their own feelings and learn more about how others may feel. Take your kid to new neighborhoods, new restaurants, new countries, Dewar suggests. You don’t have to go far, though, to expose them to new things. Walk down a different street than you normally would to get home. Have them help pick out something new at the grocery store to try. Exposing your child to new experiences will help expand their mind, which will serve them well in adapting to new people and situations. One way to know if your kid is exhibiting sociopathic tendencies? If they are more interested in harming your pet than loving your pet (the American Psychological Association lists harming animals as one of the indicators). But in all seriousness, allowing your child to interact reguelarly with animals can help teach them empathy. It can be quite beautiful. Our toddler “awws” when he sees the cat each morning, and the two of them have a little friendship that is enough to melt hearts. We also put a bird feeder and peanuts outside our window, and our son spends a ton of time each day watching the birds and squirrels come to eat, and he loves it. He even helps and carries the birdseed over to feed them, a great sign of caring for others and practice for more important moments of empathy later in life. You may not have time to read Malcolm Gladwell’s Emotional Intelligence, but you can employ these and other simple steps to help your child learn how to connect with themselves and with others around them.